Extra Life Jax, GAME ON! Josh Pafford, the Customer Service Manager at Publix store #1176, is passionate about helping local kids and wants to see his fellow Publix associates get more excited about fundraising for Children’s Miracle Network Hospitals outside of the workplace. He first organized a district-wide Publix Kickball Tournament to benefit CMN Hospitals in 2016, and little did he know two years later the event would still be going strong. 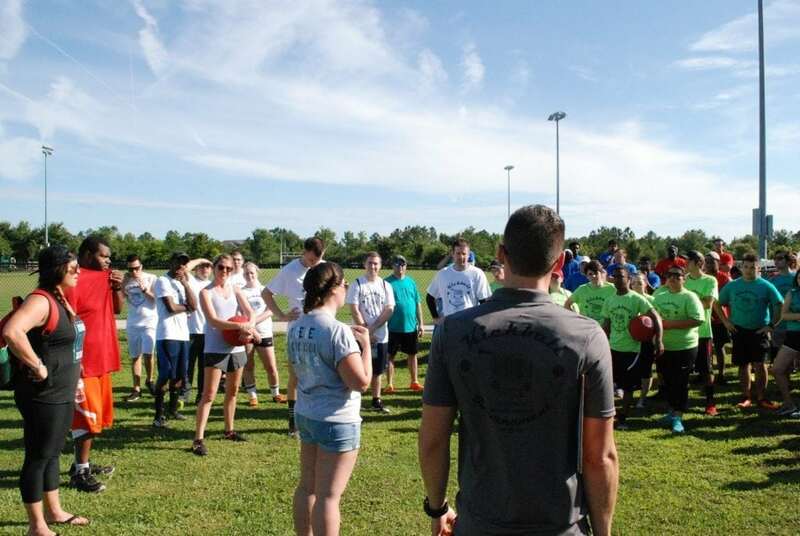 Eight stores competed in the third annual kickball tournament for CMN Hospitals Jacksonville on June 14. The tournament was held at the 9A/Baymeadows Regional Park and raised $1500.00. The funds were split up among the winning and runner-up teams to be added to their store’s CMN Hospitals campaign total. This kickball event is an activity that associates have started to look forward to each year as a way to meet and connect with fellow colleagues. Josh’s main goal for the event was to see it grow and increase participation year after year. Last year, six stores competed, and this year eight teams came out to participate in the tournament! There were some honorary team members as well! “I think Children’s Miracle Network helps bring people together because they are working together to help others”, said Erin F., Customer Service Associate, pictured above. Josh believes that being able to have friendly competition and enjoy the outdoors with one another is a great morale booster for employees, which is just an added bonus to raising more funds for CMN Hospitals. Upon observation, it is easy to see that fundraising, helping others, and empowering individuals to do the same are priorities for Josh in both his personal and professional life. The original inspiration for putting on this event, according to Josh, was the need for an outside activity to make a connection of “fun and fellowship” with Publix’s campaign for CMN Hospitals. He dreams of seeing the kickball tournament become an event that is welcoming and engaging with the community of Publix employees, but also the community at large. Josh wants to make the tournament even better next year, including things like food trucks and even a DJ. “My family has benefitted from Children’s Miracle Network because I have a cousin who had to have multiple life-saving devices to keep her alive. She has future treatment in front of her, and I know my family has directly benefitted from the type of life-saving equipment that Children’s Miracle Network helps provide,” Josh said as he was sharing his motivation for supporting CMN Hospitals. In between games, players were invited to catch their breath and have refreshments with some of the staff from CMN Hospitals Jacksonville. Having face to face conversations with the associates outside of the Publix stores was a valuable opportunity to encourage and thank them for going above and beyond by playing kickball on a hot day in Florida. “We’re raising money for real kids and making a real difference in their lives. I think about if it were my kid, I would want someone to make a donation as well”, Elliott Kinney, Customer Service Associate, when asked why he was playing. Other players also discussed how fundraising for CMN Hospitals has positively impacted their lives. “Campaigning for Children’s Miracle Network has taught me to think outside of myself, which is good,” Andy Nguyen, Customer Service Associate. The winner of this year’s tournament and $1,000.00 to take back to their store’s campaign was Publix Store #1468 for the second year in a row! The runner up was Publix Store # 1176 with second place and $400.00 to take back to their campaign. The final $100.00 went to Publix Store #1177.